We recently spent some time in Portland, Oregon. A city known for being 'home of the hipster', visiting Portland is less about seeing tourist spots and sights, and more about experiencing and tasting what the local community has to offer. Many food establishments place emphasis on their use of locally sourced and in-season ingredients. It is also a very eco-friendly, socially conscious city, that supports many diets; from vegans to omnivores, vegetarians to carnivores and everything in between. As a result, the Portland food scene consists of an array of unique flavours, delicious dishes, tasty treats and so many choices and food experiences it's hard to decide where to start. Bonus: Being in the state of Oregon, where there is no sales tax, your meal out, morning coffee or shopping trip will cost you a lot less than you might be expecting. We had just a short time in Portland, but we made the most of it with plenty of 'walk-sploring' and plenty of tasting. Here's some of the good, the interesting and the not-so-good food we tried in the 'City of Roses'. A nice way to spend a sunny Saturday (or Sunday) morning, this market displays a huge assortment of goods, mostly from local artisans, producers and sellers. Food, art, clothing, jewellery, soap and health products, garden ornaments, cooking spices, honey, plants and so much more. They also had a row of food trucks/stalls, so after you've spent your morning wandering the wares, it's a great spot for an early and casual lunch. They had lots of options from all over the world, and all at very reasonable prices. We tried Fish and Chips, and Northeast African food, which were both delicious. Just next to the Saturday Market, is the infamous doughnut store Voodoo Doughnuts. The line is consistently long, but moves pretty fast. They have a decent selection of interesting flavours and uniquely decorated doughnuts, alongside some more classic flavours if you don't feel like being too adventurous. For some reason they only take cash (though there is an ATM in the shop), and they hustle customers through like a herd of cattle, so it pays to make up your mind about which items you'd like before you get to the counter. The doughnuts were fine, though we think it's definitely a case of hype over substance. The gimmick and appearance of both the store and the donuts surpasses the taste of the doughnuts themselves. There are quite a few other doughnut stores in the city, so we would have been interested to try some other ones to compare - particularly Blue Star doughnuts. However, we ran out of time to visit those. Next time, we would check out one of the other stores before returning to Voodoo, but we're glad we tried them out. 🍽️ 🍽️ 🍽️ - Interesting experience, average doughnuts. If you are a big fan of doughnuts you might be into it. We usually find some sort of Japanese food wherever we visit - and this place caught the eye of our vegetarian travel companion. The space was bright and open, with a nice aesthetic. The ramen was pretty tasty. It strayed a little from the classic Japanese style, but the flavours were refreshing and they had good vegetarian and vegan options. The temperature of the ramen broth could have been a little hotter for one of the dishes. We didn't quite have the appetite for ramen AND dumplings, so would be interested to try the dumplings next time. As we walked around the city, we discovered an extensive selection of two kinds of treats: doughnuts and ice cream. The weather was warm and summery, so it was the perfect excuse to try some of the latter. After spending a morning wandering through Forest Park, we walked back into town and past the first scoop shop we tried, Salt & Straw. The staff were very friendly, and the flavour selection was exciting and unique, using locally grown and produced ingredients. We got a flight to share with 4 different flavours; Birthday Cake & Blackberries, Wasabi and Raspberry sorbet, Freckled Woodblock Chocolate and Strawberry Honey Balsamic with Black Pepper. 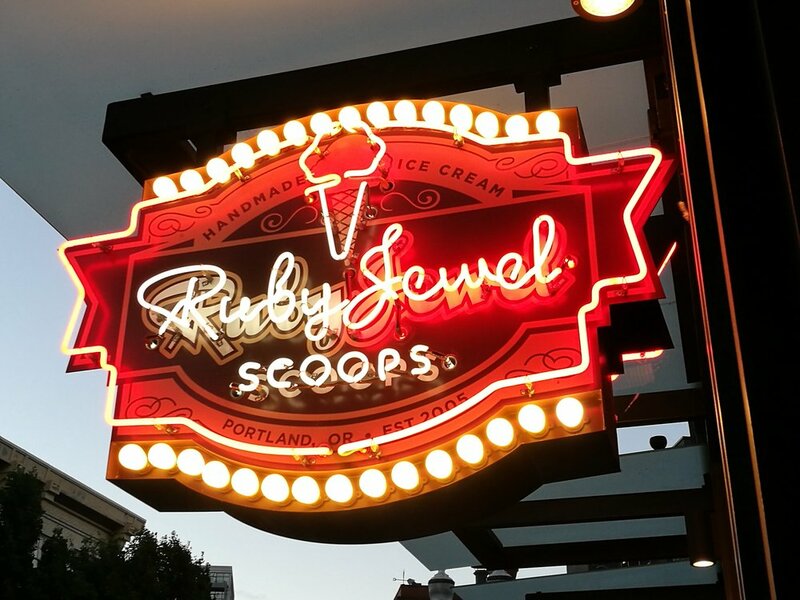 The second scoop shop we tried was Ruby Jewel, a bright pink, retro-style shop that offered cones, cups, sundaes and cookie sandwiches. This place had slightly more conventional ice cream flavours, but nonetheless it was delicious and offered a more classic ice cream parlour experience. Here we tried 2 flavours; Honey Lavender and Double Chocolate. We walked past this place almost every day, and it was also right over the road from Powell's Bookstore, so we took it as a sign that we should try their pizza. They had a good selection of meat based, vegetarian and vegan flavours available, and they also offered pies, slices and half slices - top marks for flexibility and choice. The pizza itself was classic New York style and all the slices we tried in our group were delicious. Between us, we had Cheese, Spinach & Mushroom and Pepperoni - classic flavours, done well. When you put the words 'Korean' and 'BBQ' together, we are intrigued. It's always interesting to taste a Western-Asian fusion restaurant, and this place did a pretty good job of blending BBQ style smoked meat, and the flavours of Korean cuisine. Probably not the best Korean nor BBQ food we've had, but it was a nice meal with good service and a great selection of local beverages on offer (the ginger beer was amazing!). We both had Bibim Bap; one with Honey Gochujang Chicken, the other with Galbi Beef Short rib, and both smothered in delicious Gochujang BBQ sauce. The meat was a little dry and overcooked, but the dishes were tasty and had a good level of spice. Carrying on with the BBQ theme, we heard about a vegan BBQ joint, and were interested to give it a try. Google maps did NOT make this an easy place to find, as it kept redirecting us to where their old food-truck used to be, but we eventually got there, hungry and ready to try something different. They had an extensive menu, with a plant-based version of many American BBQ classics, such as Macnocheese, Tempeh Ribs, Chikn and Soy Curls. We chose a selection to share in our group. First things first, the dishes didn't taste very much like their animal-based counterparts. However, as a plant-based option, everything was damn tasty. It was also really filling, and we couldn't finish everything we ordered. Go with an open mind for flavourful, comforting plant-based food. Don't go expecting exact vegan replicas of meat dishes. There are so many food, drink and treat options on offer in Portland, it can be hard to choose where to go and what to taste. We really enjoyed exploring the city and getting a taste of the local flavours and food specialties. We feel like we barely scratched the surface with this unique and beautiful city. It seems like the kind of place where you would be constantly finding new and exciting things to eat, drink and do. Are there any places in particular you would add to our list? Anywhere we should check out if and when we go back? Let us know here! We'd love to hear your thoughts and recommendations.